Estimated reading time: 7 minutes, 42 seconds. Everyone always says, “join a gym, you will be better for it”. But have you ever actually stopped and thought about why the gym is so beneficial? Well, there isn’t one clear answer to this question. Being a part of a gym offers a whole host of benefits that can differ greatly depending on the individual. Instead, you need to ask yourself what is lacking in your life and to see if being a part of a gym is right for you. To help you out, here are 10 of the best reasons we could come up with. The obvious benefit of joining a gym is that you have the chance to become a much healthier person. Working out is a vital component in leading a truly healthy lifestyle. To understand exactly why, let’s break things down into the 3 main benefits. By performing a mixture of cardio and resistance exercises, your body will be able to burn of excess levels of fat. Not only will you look better for this, you will also feel better as a result. Utilising cardio machines, such as the static bike and treadmill, will help you to improve your cardiovascular strength. In turn, you’ll be able to perform almost any task for longer before feeling out of breath and tired. By lifting weights and using other resistance machines, you can quickly start to increase the levels of muscle you have all over your body. This will help make you stronger in all your daily activities. It will also help to boost your muscular endurance, which is how long you can sustain a strenuous activity before needing to stop. Deciding to join a gym is not a decision that should be taken lightly. To start to see real benefits you will need to visit regularly and be willing to push your body. But don’t worry, this doesn’t have to be a chore. In fact, being a part of a gym gives people something to focus on achieving each week. You have the chance to set yourself goals and targets. As a result, your mind can become more centered and focused as you realise you are able to push yourself to achieve great things. 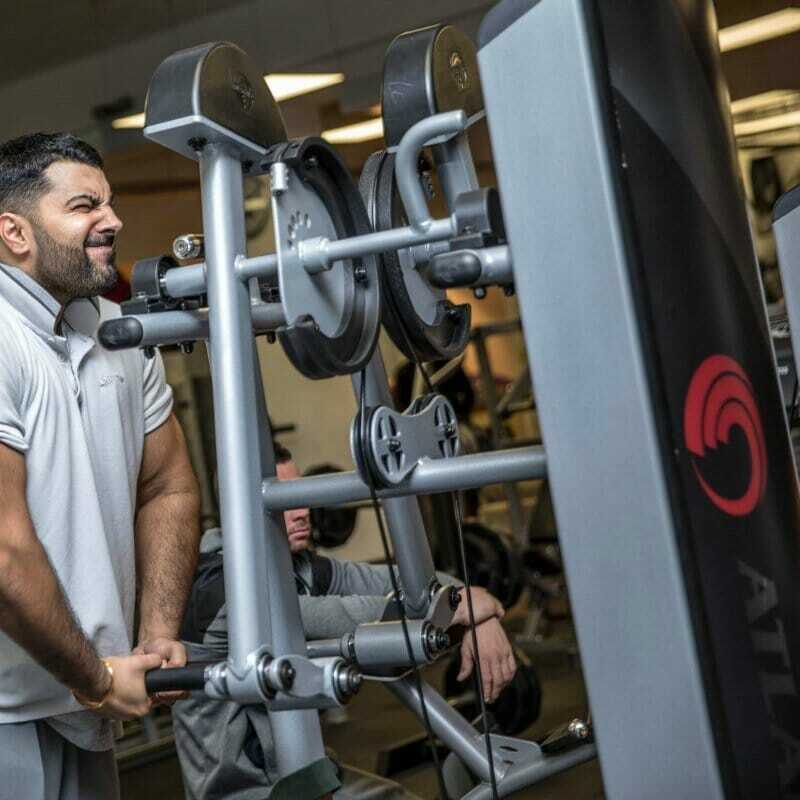 Many of our members at Ultimate Fitness strive to place their gym sessions at the very start of their working day, in order to organise their thoughts for the day ahead. For many people, running a marathon or becoming the next Arnold Schwarzenegger are not the motivations behind hitting the gym. In fact, most people make the decision to join the gym after first deciding they want to alter their diet plans. Sticking to a rigid diet can be tough and it is easy to slip back into old habits after even just a short period. However, being a part of a gym is a great way to motivate you to actually stick to this new meal plan. This is because, after having put in all the hard work at the gym, you are less likely to give into temptation and spoil this effort. Many people also tend to find that, after having been to the gym, they crave only healthy foods instead. Don’t forget, when you head to the gym it is not meant to be a solitary experience. There is a great sense of camaraderie to be found in a gym, as everyone respects one another’s effort to improve their lifestyle. As such, it’s natural to strike up conversations with other members and get to know those around you. If you become particularly passionate about working out, then we often encourage our member to find a workout partner. This allows you to increase your motivation for attending the gym, as well as boosting energy levels whilst you’re there. Safe to say, becoming a regular at a gym is a great way to meet new people and make new friends. In the short run, exercising at some point in your day can help make you a happier person. You get a natural release of endorphins that leaves you feeling great. But in the long run, being a regular gym-goer can be great for your happiness and your levels of self-confidence. For some, this increased level of confidence comes from knowing you look better on the outside and that others might find you more attractive. However, the most important aspect is that you will feel better on the inside. As you become fitter and healthier, you will find you’re able to do more in your day and be a more positive person and this can do wonders for your self-confidence. As such, you can exercise regularly and be safe in the knowledge that you will be around for longer. This is an important point to consider if you have already been diagnosed with certain weight-related health issues, such as type 2 diabetes. Also, if you’re a parent, then you will surely want to lead a healthier life and know you will be around for longer to watch your family grow. If your excuse for not joining the gym is that you already feel too tired due to working long days, then here’s some news for you: this isn’t a genuine excuse. In fact, those that go to the gym benefit from feeling less sluggish and having greater energy levels all day long. And this isn’t just referring to those who have been exercising for a long time and have built up their stamina. In fact, every day that you work out you will be left feeling more energised for the tasks ahead. You will be safe in the knowledge that you have already accomplished something and the endorphins can leave you feeling both energised and motivated for hours. If you work out from home, then you will naturally be limited in how much you can learn about exercising and nutrition. However, by being a part of a gym you suddenly gain access to an endless wealth of knowledge. For advice and tips you can speak to fellow gym-goers, the staff and also personal trainers. This improved knowledge can help you to vary your workouts and make them more exciting. It can also help you to get more out of each workout as you learn to maximise your time in the gym. Better yet, it can help you to keep injuries at bay as you learn how to perform certain exercises properly and under better supervision. Are you one of these people that always starts the new year by promising you’re going to get healthier and lose weight? Well, no doubts you stick to your routine and diet for a few weeks before slowly slipping back into your old ways. Frustrating, isn’t it? Well, by joining the gym you are making a greater commitment to actually alter your lifestyle and become healthier. You can organise sessions with friends, plan out in-depth routines and then discuss these with people at the gym. Overall, this process can help you to radically increase your levels of motivation and to make sure you actually stick to your workout plans. If you’ve been thinking about it for a while but were looking for a solid reason to join the gym, hopefully now you’ve found it! With years of experience spent helping people achieve their fitness goals, we can wholeheartedly say that being a part of a gym is a wonderful lifestyle choice. Not only do we see people grow physically, but our members are genuinely happier and more centred as a result of regularly working out. And luckily for you, we are always happy to welcome new members. So, if you live in or around Birmingham and are looking for a world-class facility to join, click here to learn more about Ultimate Fitness.